Leading greeting card publisher and franchisor, Card Connection has announced that after just three years after investing in their franchise, Oxford regional franchisee Gayan Weerakkody and his wife Anjana have enjoyed such success that they have been able to purchase their first house. Gayan purchased the Oxford territory in May 2015, taking over from the previous franchisees that had held the franchise for more than 20 years. Approaching it with fresh eyes and a keen attention to detail, Gayan and his wife have tailored displays to maximize sales. For example, in villages where he supplies more than one shop, he makes sure that the card selections are different, so customers that visit the shops don’t see the same displays. They deliver greetings cards to retailers on a regular basis and return to merchandise displays with fresh stock and new designs typically every four weeks. This ensures displays always look attractive and as a result maximize sales for each store. Conveniently, the retailer only pays for what is sold. No wonder then, that they are always happy to see a Card Connection franchisee, as there is simply no hard sell involved! 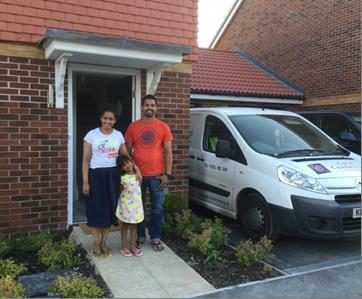 “We are very happy that we have joined Card Connection as this has given us the chance to become self-employed running our own, already successful, franchised business.” Gayan added: “If I we hadn’t taken on our greeting card Franchise I would still be managing a shop and we’d still be living in rented accommodation”.